After some 29 hours traveling, we had safely made it to Honolulu and had just one more short hop to our destination: Lihue, Kauai. 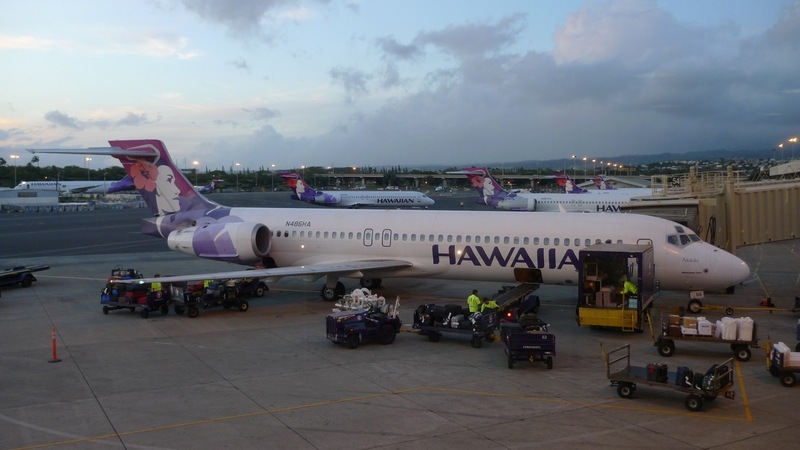 To get there, we had to take a 20-minute flight about Hawaiian Airlines, which has a codeshare agreement with Continental. We exited our plane from Guan (pictured) above and walked downstairs where we had to claim our luggage and go through customs. As you can imagine, since Hawaii is a bunch of islands they are particularly concerned about fruits, vegetables, uncooked meat, plants, and anything else entering the state that might harm local agriculture. About forty minutes after landing we found ourselves outside in the fresh (and very pleasant) air, and made our way to the inter-island terminal. The inter-island terminal is a ten-minute walk from the main terminal and is also connected by these buses called Wiki-wiki busses. In Hawaiian, “wiki” means quick, so “wiki wiki” implies very quick. In place since 1970, the buses really are anything but that. Ostensibly a new moving sidewalk system has been opened but I didn’t see it. Since our bags were checked through (we placed them on a belt outside customs so they could be connected for us), the walk was leisurely and we proceeded through security. We realized, though, that we still had better than an hour before boarding time, so I walked around the inter-island terminal to get some pictures. 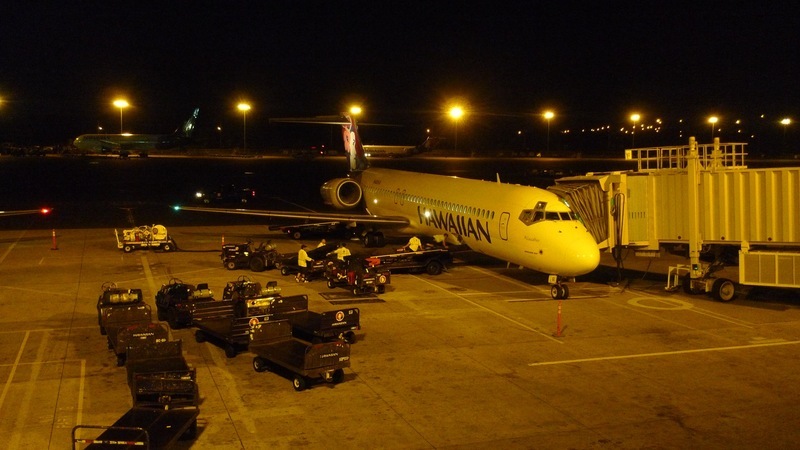 For the longest time, the state of Hawaii had two dominant airlines: Hawaiian and Aloha. In March 2008, Aloha went out of business, at least in part because of predatory practices by Mesa Air Group (who operate many regional affiliates for major US airlines) who decided to open their own island carrier called “go!” Hawaiian continues strong, though, and consistently ranks with the best on-time percentage and fewest mishandled bags of any US carrier. Here is their fleet of Boeing 717s (a modernized version of the 1960s era Douglas DC-9) at Honolulu. The airport has lots of open air areas, although since I was last there in 1994, they have enclosed and air conditioned the gates. The walkway in the picture above is open air. The garden below in the picture below is viewed from the left edge of this walkway. 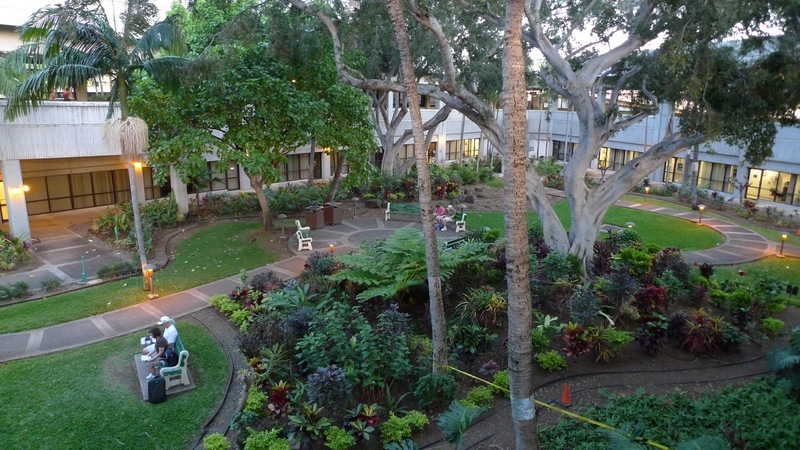 One of several beautiful gardens in the airport which passengers can spend time in. What a peaceful place to wait for a flight! 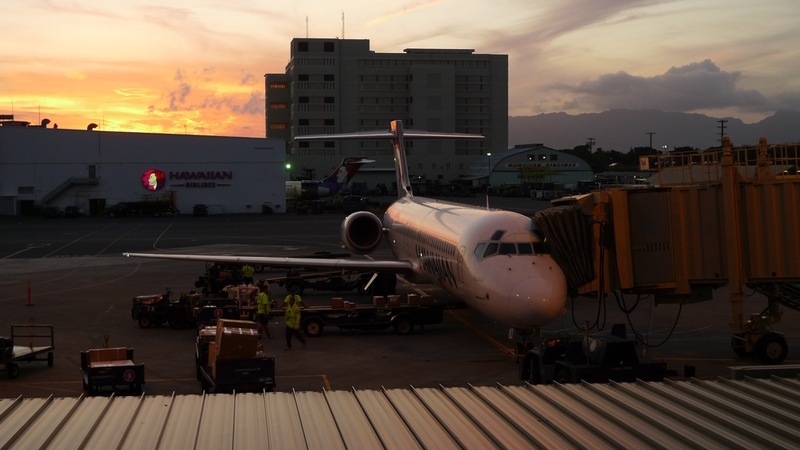 As the sun set, I caught this nice picture with the Hawaiian Airlines maintenance hangar in the background. 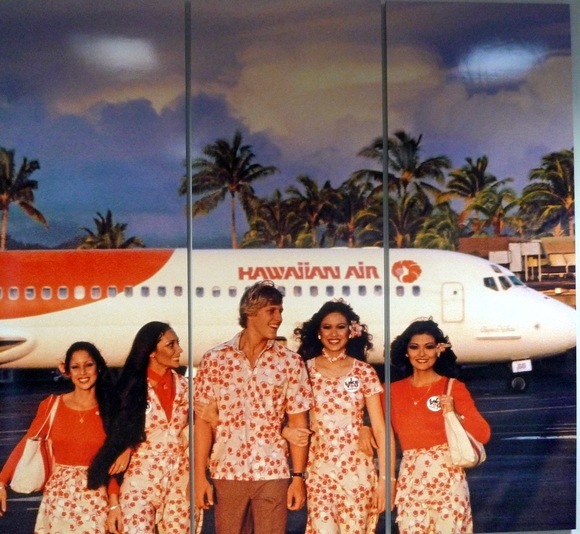 Throughout the terminal are wall-sized enlarged photos taken from different eras of Hawaiian Airlines’ history. Talk about a walk through the past! 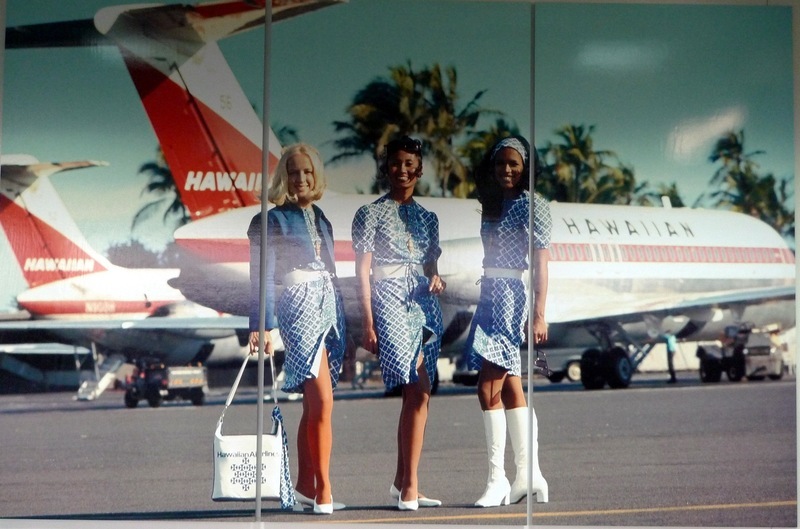 1960s – Hawaiian received their first Douglas DC-9 aircraft in 1966 and along with them, these funky flight attendant uniforms and hot boots! Go, Nancy Sinatra, go! In the 1970s, the carrier updated their look both in terms of livery and flight attendant uniforms. I’m curious where they got the California surfer boy? Must have flown in from the OC and been accosted on the ramp by the flight attendants! 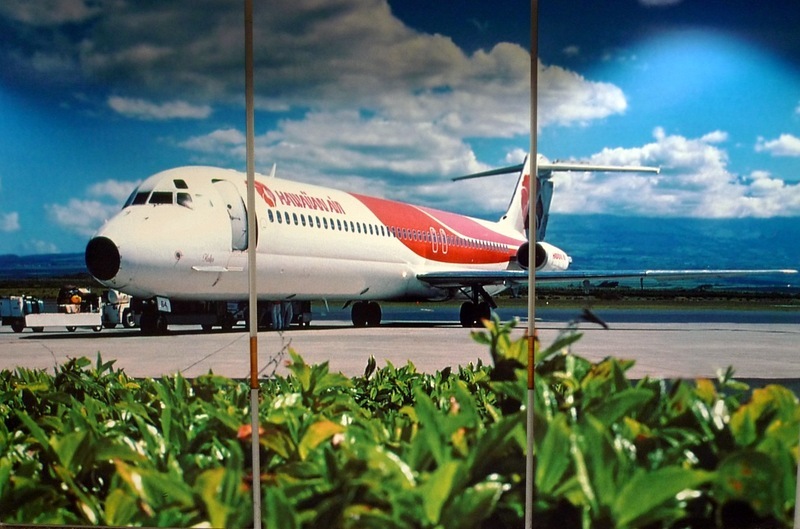 This picture, probably from the 1980s, is very pretty, showing off both the beauty of the islands as well as of the airplane. 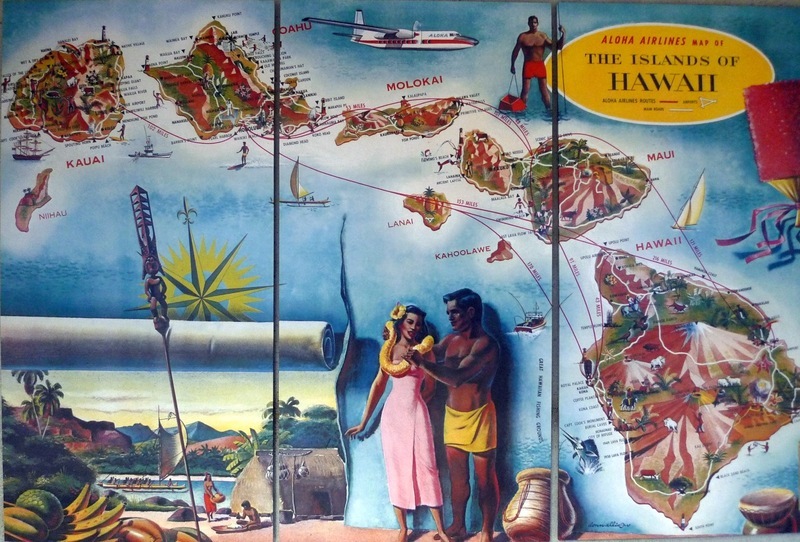 One reminder of Aloha Airlines is this mural from a route map they had published in the early 1960s, based on the aircraft shown, a Fairchild F-27. Beautiful illustration, isn’t it? 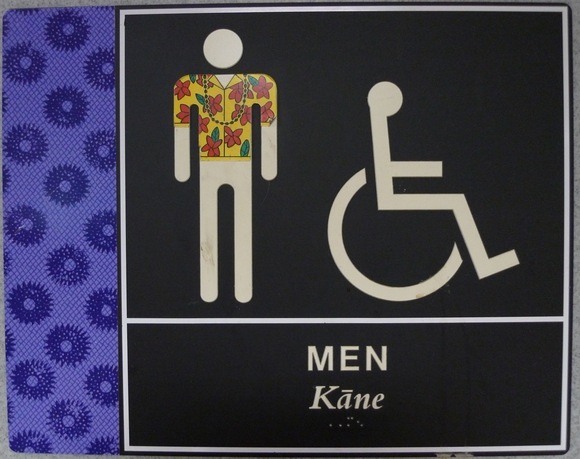 Speaking of nice illustration, the toilet signs are appropriately decorated with aloha shirts for the men and muu-muus for the women. 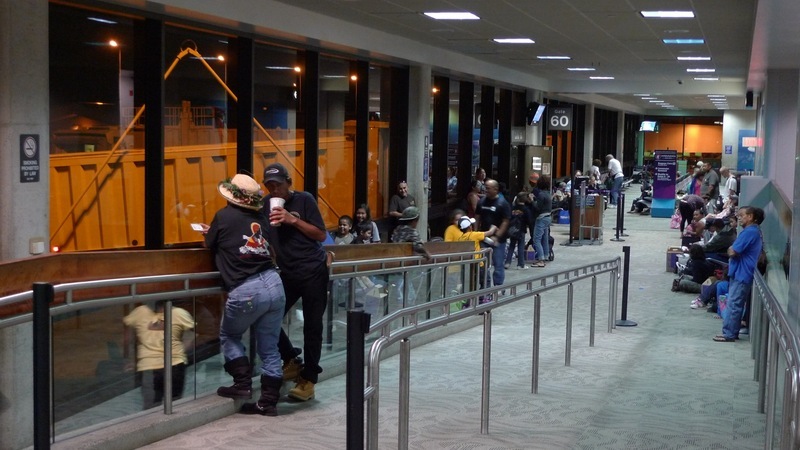 As night fell and departure time neared, the gate area started to fill up. Among our fellow passengers, a group of elementary school students and their parents, flying to Kauai for a weekend outing. The flight attendants gave them a special shout-out when we landed. Our aircraft, almost ready to board. Watching their ground crew move, you can understand why they have such a good on-time record. Despite the islands’ laid-back culture, they certainly hustle when there is work to be done. 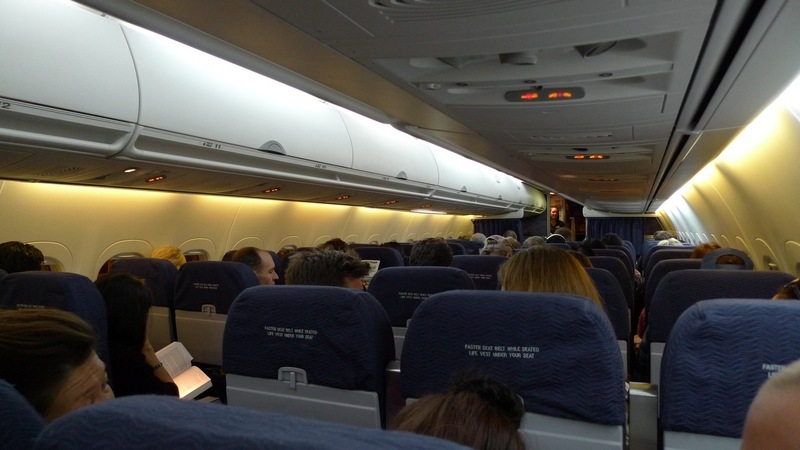 The interiors are a bit old and dark, but for such a short flight it was fine. Service was friendly, along the lines of Southwest Airlines. For our 20-minute flight, the only “inflight service” was the handing out of containers of POG – passionfruit, orange, guava juice – and then quickly collecting them. Seriously, we took off, leveled at about 5000 feet (versus 35,000 for a normal flight), and then were descending almost as soon as we had leveled off. Finally, about 32 hours after leaving Bangkok, we landed smoothly on Kauai, retrieved our bags in the open-air bag claim, and waited for my parents to arrive and pick us up. At last, we were there! This entry was posted in Uncategorized and tagged airline, airplane, airport, Hawaii, Hawaiian, Honolulu, Lihue by christao408. Bookmark the permalink. Oh I love that open air walkway and the garden. Those boots! hahaha… how can you wear that in the tropics? I would hate to be near her when she takes them off. 20 mins? That must be the shortest flight ever – or is there one that is even shorter? Great blog. I liked traveling with you!!! Aloha! I love the islands. I did the short flight too. But it was a small plane with only 20 people. From then on I took the boat to the other islands. Enjoy your stay! Wow, the garden inside the airport is so awesome. Every airport must do that- it doesn’t seem that difficult to execute! aww, that makes me miss home! 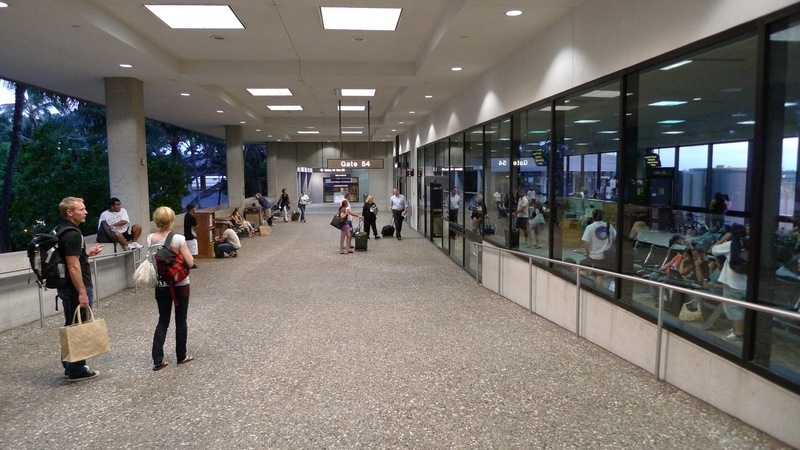 i haven’t been to the inter-island terminal of hnl in such a long time, since i’ve stopped flying hawaiian (they don’t fly past the west coast). it looks like not much has changed. i also really love the 717s; they’re much quieter because the engines are located way in the back of the plane. and the pog! yes, flights to the neighboring islands are really short, so you don’t spend much time in the air. but it’s kind of funny, flying is really the only way to get from one island to the next — they implemented a ferry a while back, but it never really became a popular alternative. 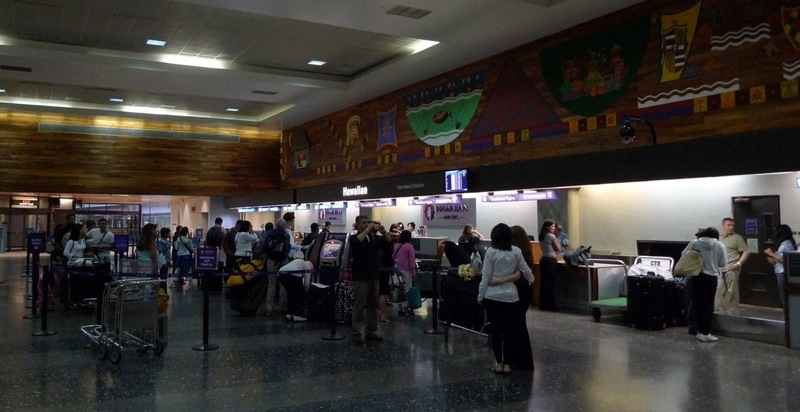 I kinda remember walking through the terminal on one of my prior visits, after looking at one of your photos. W and I are pondering a trip to the Big Island this coming June too. The flight attendants uniforms are quite groovy back in those days, I guess. Hey Chris, I still have that mouse pad with the 1960’s route map mural! Very cool! Ooooh, this makes me long for another trip to Hawaii. It’s been years. I’ve never been to Hawai’i. Maybe that will be in the cards someday… Loved the sunset photo! That airport garden is super cool. They have gardens at their airport?! Well, I guess I shouldn’t be too surprise. I really need to visit Hawaii!